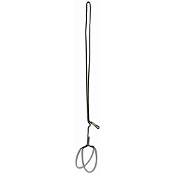 BlueWater Ropes Titan Cord Foot Loop. Specially designed, fully adjustable length footloop. Made from BlueWater 5.5 mm Titan cord for extreme durability and super low stretch. The stable, round cord shape significantly reduces friction versus the use of webbing type footloops when used as a rescue/lift tool and makes rope access pick-offs much easier. Twin loops allow for single or double foot climbing techniques. Tubing adds structure to loops to make insertion/extraction of the foot fast and easy without fumbling with loose, sloppy loops. Made in the U.S.A.